Dickens' classic tale of kindness, truth and virtue completely ruined by having a member of the Blackadder family involved. 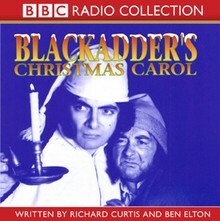 Stuffed with deeply horrible people and groaning with cartloads of seasonal bottom jokes, it manages to squeeze a Victorian Blackadder and his Elizabethan, Regency and Space Age relatives into a huge pie of entertainment which will satisfy everyone - unless you're a beadle, an orphan or a long-dead member of the Royal Family. Also includes The Cavalier Years in which Lord Edmund Blackadder and bottom-breath Baldrick remain faithful to King Charles who awaits execution - or do they?